Cauldrons have long been used within wicca and witchcraft for many different purposes and from ancient times to current the cauldron continues to be a main stay within the craft. So what makes a cauldron such a vital tool within wicca and witchcraft? 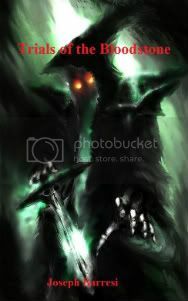 Well there are many different roles a cauldron can be used for anything from cooking, to being used as incense burners, or even as a fire resistance pit for burning items for rituals and spells. In wicca a cauldron symbolizes the womb of the Goddess and can also represent rebirth and purification through fire. The cauldron is considered a sacred vessel to the Goddess and so many individuals within the craft favor using it for this purpose. In Celtic influenced wicca the cauldron represents the goddess Cerridwen and Celtic legend also tells of a cauldron that was useful to warring armies: dead warriors could be put into the cauldron and would be returned to life, save that they lacked the power of speech. It was suspected that they lacked souls. These warriors could go back into battle until they were killed again. Almost all cauldrons are made from cast iron as this material is highly resiliant to fire and will not burn or be damaged from the flames like other materials. Cast iron is also durable and strong and if properly kept clean and dried out after use will not rust that easily like other metals. 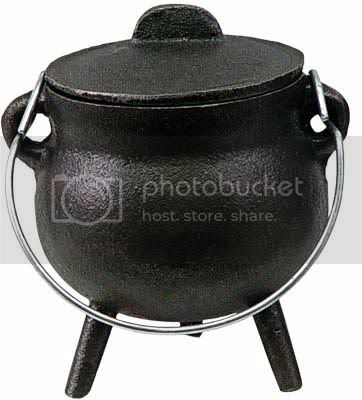 Many cauldrons come with lids and a metal handle useful for carrying and transporting them around either full or empty and the lids will protect the user from and the contents inside much like modern pots being used on the stove. Cauldrons are excellent for cooking over camp fires or fire places and for centuries humans have used them to cook anything from stews and soups, to meat and beans. 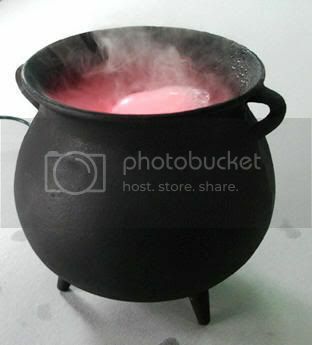 Cauldrons can also be used as incense burners when granular or powder incense is burned within the cauldron. If charcoal and incense are placed within a cauldron and lit the incense will begin to burn and smoke and there is no fear of the heat or fire breaking loose out of the cauldron as the cast iron holds and abosobs the heat extremely well leaving one with a pleasant burning incense for quite some time until it burns out. For ages within witchcraft and wicca the cauldron has been used for rituals and spell use. Not only are cauldrons excellent tools because you can use fire safely but they also allow for a myrid of different ingrediants and items to be burned in a ritual at the same time. 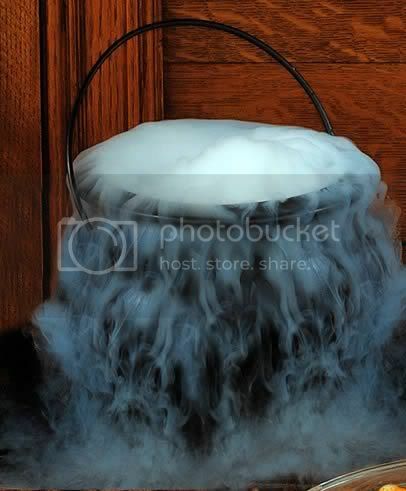 Cauldrons are also well adepted at being used for scrying once filled with water. Below is an example scrying ritual to perform with your cauldron. Fill a cauldron or large, black iron pot half-full of fresh water. Add a handful of Buttercup or Marigold petals. Light incense of Sage (also used for protection) or burn some Thyme. Stir the cauldron/pot gently three times while chanting: Into the threads of time I cast my thoughts, To catch a glimpse of what will be! O' Gods of Asgard, bring into my mind, The lovely gift of prophecy! Look deep into the cauldron and wait for visions to unfold. You don't request insight into any particular matter using this method. Layer salt, wax shavings, three powdered or ground herbs, lighter fluid and ivy leaves in the cauldron while focus and chanting. Use a candle to light it. When the smoke starts to roll, extinguish the cauldron by putting the lid on. Cover the inside bottom with dirt or sand to dissipate heat. Light incense charcoal and add either salt-peter for flame and spark or flash powder for a different but spectacular effect. To assist in releasing or firing off peak energy, try using flash "bombs". Make a small pocket in a piece of flash paper, fill with flash powder and tie with thread. The "bomb" should be about the size of your smallest fingernail. The results are spectacularly bright, so use the powder sparingly. Don't look directly at the flash as you drop the "bomb" in the cauldron. The cauldron, as the fifth elemental spirit, symbolizes inspiration, rebirth, illumination and rejuvenation. Use a Fire cauldron with salt-peter to cast a Circle. Use the mists of an Air cauldron for an initiation. Burn away hate, prejudice and negative self-images, with a Water cauldron. The Earth cauldron is ideal for indoor Beltane rites. Traditionally the besom broom has been and sometimes is continued to be used within wiccan weddings where the couple jumps over the broom during the ceremony. This represents the couple "crossing the threshhold" into homes to begin their new union together. 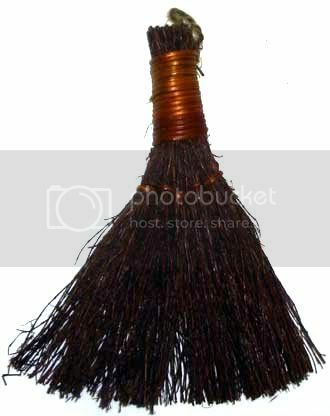 This broom jumping also represents fertility and domestic harmony and longetivity. Should the marriage not work or end in a divorce jumping over the broom backwards will break and end this symbolism between the couple. 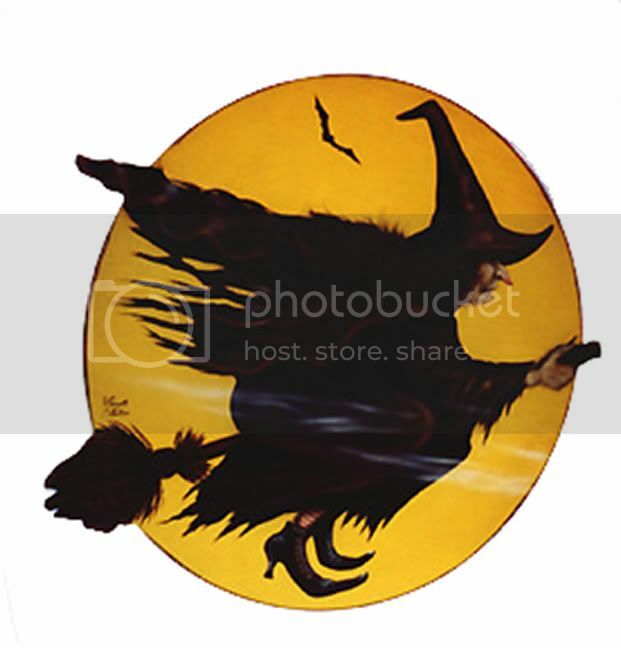 The image of witches flying around on broomsticks casting vengeful spells is believed to have come from old fertility rites associated with nature and agricultural. As part of the seasonal Spring rites to aid the growth of newly planted crops, women from local villages would gather around fields with their besoms. Placed between their legs as they circled the field, much like riding on a hobby horse, the idea was the higher they leapt, the higher the crop would grow. This soon turned into the idea of woman flying on a broom over their fields to ensure that their crops would be healthy and continue to grow. In renaissance times, according to the demonologists, the Devil himself presented brooms and flying ointment to newly initiated witches so they could fly to the Sabbats. Often they carried with them familiars in the shape of demons or animals. They were also said to fly across fields blasting their neighbour’s crops, or ride out to sea in order to rise up storms. However, such concocted myths were generally forced from the poor tortured victims of the persecutions, and should not be taken seriously. A besom was made from three different woods, Ash for the shaft, Birch twigs for the bristles and Willow strands for the binding cord. Ash is protective and has command over the four elements, Birch is purifying and draws spirits to one’s service, while Willow is sacred to the Goddess and binds them all together. In modern witchcraft today, while the traditional besom still takes pride of place, other woods are used for special purposes: Oak for added power and protection, Pine for luck and health, Redwood for longevity, Maple for love and money, Walnut for health and wisdom, and Cinnamon for spirituality. Cinnamon is also very popular because it leaves a pleasant armoa and scent throughout your home. Cinnamon brooms are quite popular and many different individuals that make besom brooms by hand will often soak and anoint besom brooms in cinnamon scented oil. Sweeping the area with a besom can be done in addition to or in place of incense, to purify ritual space, and is often used for such when rituals are conducted in smoke-free areas. When not being used in ritual, place your magical besom by the door to protect the home from evil spirits and negative energies. When standing a besom, always place the bristles up, with the shaft on the floor. This not only makes the bristles last longer, it will also bring you good luck. Another old custom was to place a besom outside the door, this as an indication to other witches that the occupants are out, or working, and didn’t wish to be disturbed. Birch twigs (about 1-2 ft. in length) to act as the bristles. Soak the Birch twigs and Willow strands overnight in warm lightly salted water (to make them pliable) and allow them to dry slightly before using. They need to be damp and pliable before binding them to the Ash shaft. Arrange the twigs alongside the shaft about 3-6 inches from the bottom, larger twigs form the centre of the brush with shorter ones around the outside, then bind them with the Willow strands. Be sure to tie them very securely. Use as many layers of twigs as you like depending on how full you want the brush to be. Leave overnight to dry. To magickal realms beyond both space and time. To magickal lands my soul will sail. So do I consecrate this magickal tree. Once consecrated for use in the magick circle, it should not be use for any other purpose. When making a besom for normal household usage, it can still be magically charged for that use. On one side of the shaft (from the bristles travelling upwards) carve the following words while visualising your intent: “I sweep out evil and poverty.” On the opposite side of the shaft (from the top travelling down to the bristles, carve “I sweep in money and luck.” When sweeping, visualise the same intent, but sweep towards the fireplace if you have one. If not sweep in any direction except towards the front door, so as not sweep out and lose your good luck. Placing a broom across a doorway allows your departed friends and family to speak to you if they so choose. As long as the broom remains, they can communicate freely. To bring rain, stand outside and swing a broom in the air over your head. If lightening blows your way put a broom on your porch to act as a lightening rod. Electricity and lightening are thought to be attracted to brooms. Another way to safeguard a house against lightning strikes is to cross a spade and a broom outside the main entrance. A besom placed under the bed or beneath the pillows at night, will protect the sleeper from nightmares and ensure a peacefully sleep. Similarly, it is not wise to leave a bed empty for too long. If you are going away for any length of time, place a besom in your bed, laying the bristles on the pillow. This will guard the bed against evil spirits until you return. Two crossed besoms hung on a wall or the back of a door will protect the house from unwanted influences. 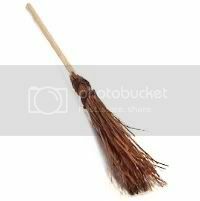 With the exception of those used exclusively for magickal purposes, moving an old besom into a new house will result in bad luck. It has been quite a while since any updates have been made to our blog but rest assured we are going to continue to add informative information about everything that involves the occult, paranormal, witchcraft, wicca, and everything that falls into that category. Some articles we have planned to post soon is part 2 on how to banish demons though this one will involve how to handle and banish an individual who may be possessed. We also have in the works many different articles about a variety of wiccan and witchcraft products and how to use them properly in rituals and spells including 7 day jar candles, bath salts, besom brooms, cauldrons, and more. We appreciate you subscribing and keeping track of our blog and we will be back to posting on a regular basis very soon.